I thought I'd share some new spin-ins I've been tinkering with. 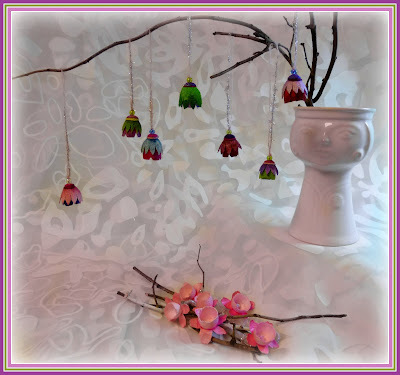 I've made them with silk cocoons which I hand paint using silk dye, then I steam set them to fix the colors. These latest creations are another variation of my HotHouseFlowers. These newer flowers have more detail, tiny little touches here and there. I love fussing over little projects like this and I already have plans for them! Now I'm off to go see what all the creative folks have been working on this week over at Wonder Why and Natural Suburbia, the Friday blog hops are really inspiring, pop over and check them out! I hope you have a wonderful, creative weekend! Blessings Friends! Recently, I decided to do a little spinning just for myself. 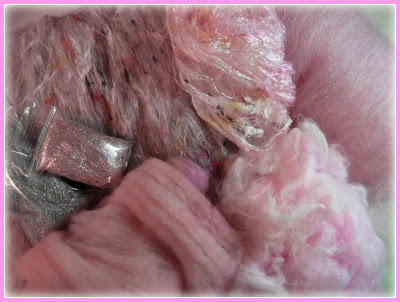 I picked all my favorite fibers and dyed part of the batch in lovely soft shades of pink, the rest of the fiber I left natural. I used BFL, Corriedale and Coopworth wool, Alpaca, Angora, Cultivated Silk Top, Recycled Sari Silk, and Angelina. I used my Pat Green cradle picker to open the fiber and then ran it through again to blend it. That Picker works like a dream. The next step was to blend it on the carder. I didn't want to completely blend the different fibers or the colors from the dyed fiber, but yet I knew I was going for a lace weight yarn so I wanted a smooth, well carded batt. 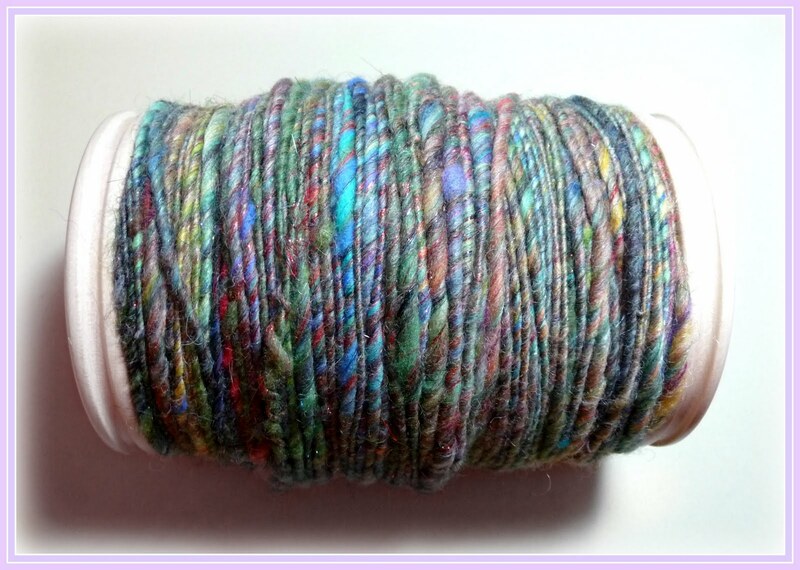 I ended up breaking up my fiber into four batches and running each batch through the carder three times. Then I layered them all together and ran each combined batt through twice. For these batts, this nicely blended the different fibers/colors enough to make smooth batts, while retaining some of the variation in colors. 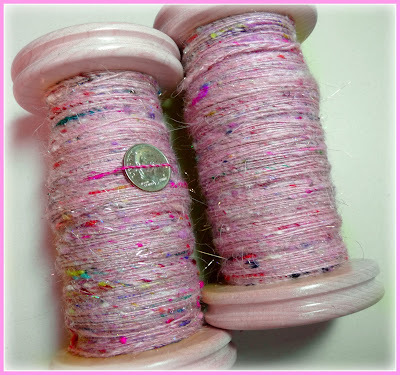 With the addition of the silk and the longer wool fibers from the Coopworth, I would have felt completely comfortable using these bobbins as a singles yarn. I've been working on a secret project, I'm participating in a tea cozy swap over on Ravelry. My swap partner Lisa received her parcel this week, so I'm free to post pictures. I knitted up this fulled tea cozy using the stitch count and decreases from this pattern by Kristen Nicholas, from knitty 2006. I added my own touches, the checker board pattern, the ring at the top, and an i-cord edge so I could personalize it a bit for Lisa. I also lined it with red quilted fabric to keep that tea pot of hers extra cozy warm! This is a picture of her kitchen, which I love, she even has a red microwave! I think the tea cozy fits right in. 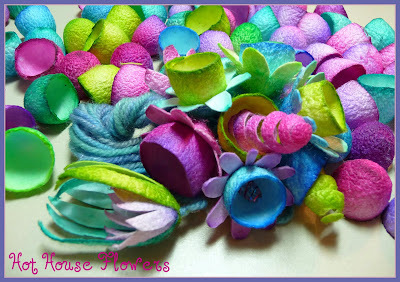 I wanted to explain about these little felted rings. They're drip catchers meant for the spout of the teapot. You can buy something that works similar, a plastic ring with a little terry cloth insert. I was hoping to find a nice red one to send along with the swap parcel, but no luck. Then I had the idea to make a little felted ring myself. It's actually an advantage, since these are much easier to wash. If you want to make some for yourself, it's really simple. Using size 6 double points, cast on three stitches using two strands of 100% wool held together. 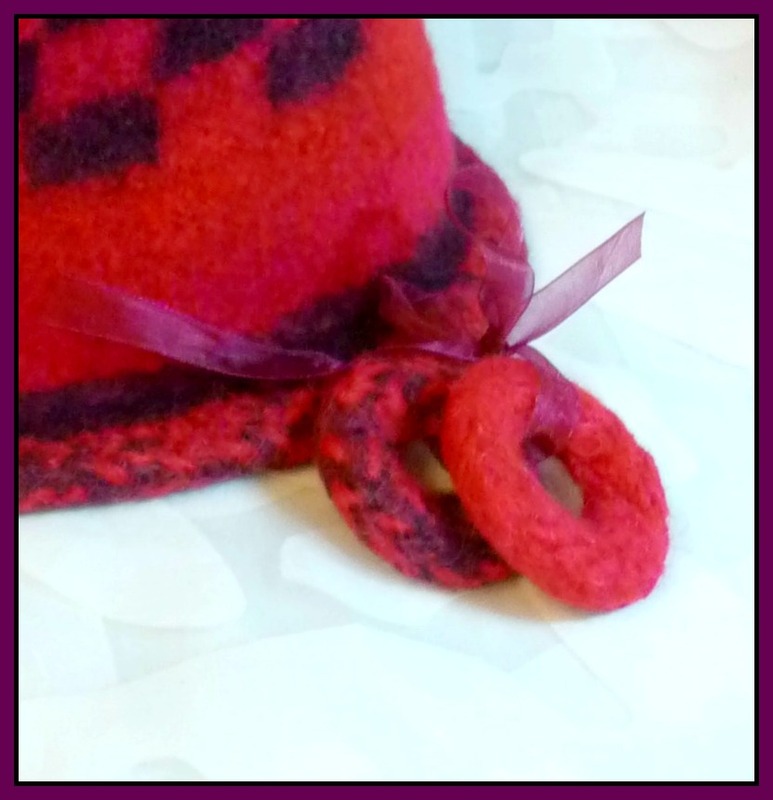 Knit an I-Cord for 4.5" then bind off the stitches as one stitch and join the two ends to form a ring. There is a great tutorial here at Natural Suburbia, if you need a refresher on how to knit an I-Cord. 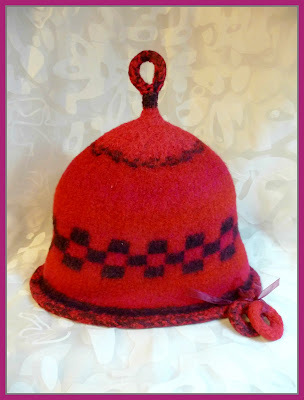 After you get a few knitted up (it's always nice to have a spare or two) toss them in a hot washer and agitate until they're the right size to fit snugly over your tea spout. Here's a little trick I use when I'm felting/fulling in the washer, I put the items in a mesh lingerie bag along with three tennis balls. This keeps them all together and the fulling process goes a lot faster. 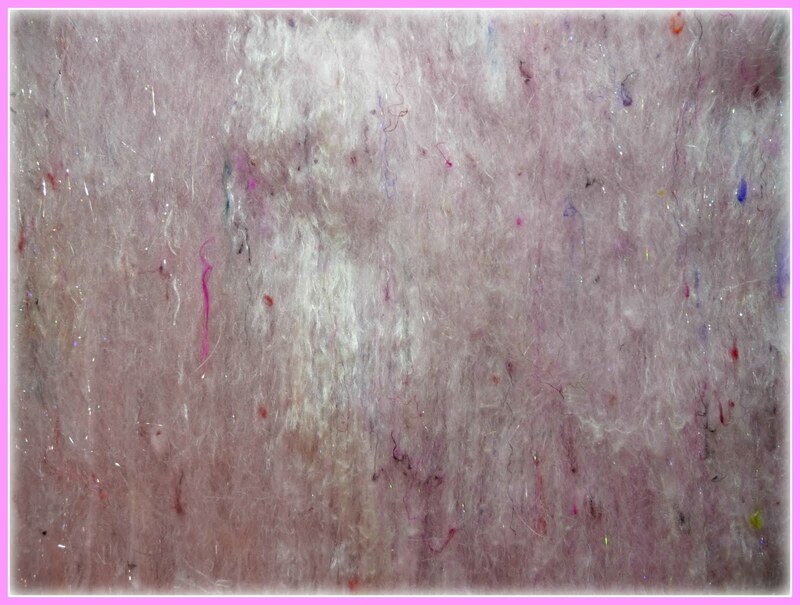 I collected all the fiber samples I received from the last three months worth of the Phat Fiber Sample Boxes, carded them together into three gorgeous batts and spun them all on my Lendrum. I like to spin using my jumbo flier and the nice big bobbins. I decided to weigh this one after it was full to see how much the bobbin could hold. I actually think I could have gotten a bit more on it, but I ran out of fiber. 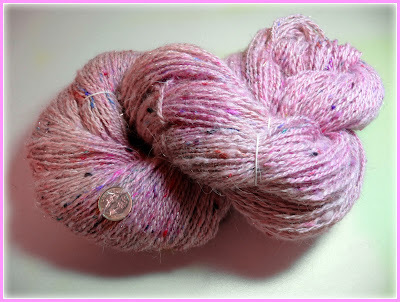 The bobbin itself weighs 6 ounces, so I deducted that from the total weight and I was amazed to see that it weighed in at exactly 8 ounces of handspun! Now I need to decide how to ply it. It's really pretty fiber from all of the Phat Fiber Posse, and even though there were so many different colors, they look great together! I hope you have a wonderful weekend, Happy Fiber Arts Friday! Blessings Friends!